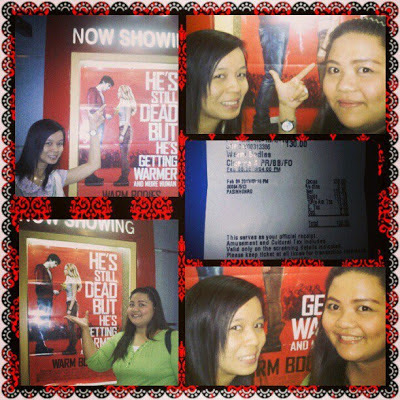 Last Saturday, after work, I was able to watch Warm Bodies with my friend/colleague. We've been waiting for this movie to be shown since last year, after we read the book written by Isaac Marion. We were so eager to see it that we didn't mind the fact that we had to travel for an hour and a half just to get to the nearest mall where we could watch it! Bakit kasi hindi ito pinapalabas sa malalayong probinsyaaaa??? The movie opens just like how the book version started---R introducing himself, how he doesn't remember his real name and how he got there in the airport or why. He introduces the other zombies and makes fun of how their lives must have been when they are not zombies yet. There you go! Have you read the book too? What do you think of the movie adaptation? Tell me in the comment box below! I am not really disappointed with those changes;reading the book and watching the movie adaptation gave me two different experiences which I really enjoyed. I say that is one weird movie. I like the premise of zombies eating brains just to get a glimpse of their victim's memories. I don't expect much whenever I watch movies adapted from books. I expect the story to change very greatly once it hit the big screen. Sometimes I even avoid watching such movies because it spoil my imagination. I love watching this kind of movies, but there's a lot of zombie movie versions and it makes me wonder if zombie really exist? I haven't read the book yet nor watched the movie. Seems interesting to read/watch. I like this movie as it gives another dimension to zombies rather than mindless wanderers. I'd watch the movie online but I haven't read the book yet. I agree! i had watched that movie too. .it was nice . .
First time I heard .. Zombie could fall in love :). You won my curiosity, I'll watch it. hehehe.